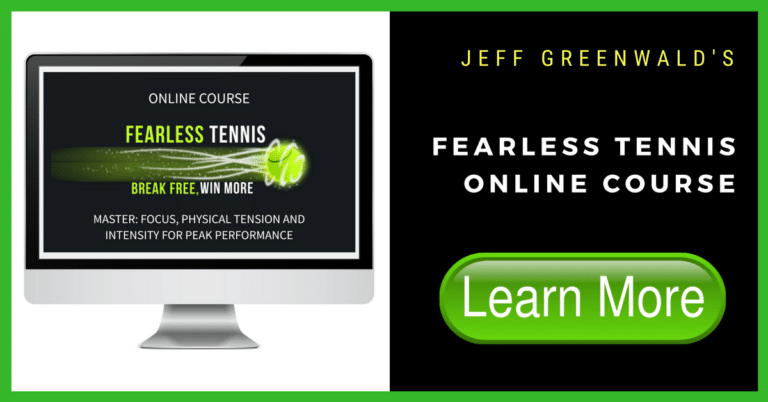 Many recreational and competitive tennis players talk about the “zone” – that magical day when the ball appears larger than usual, the court wider, and confidence is overflowing. This experience eludes most players and is typically discarded because of its elusive nature. It comes and goes, and rarely stays long. However, what many players fail to realize is that the “zone”, also known as peak performance, involves a special mental and physical state of being that needs to be properly trained. That’s right. Practice. Practice. Practice. Any competitive tennis player knows about the importance of good preparation in practice. Competitive match play, baskets of serves, conditioning, mental preparation, technical grooving, all contribute to tournament wins. Quality practice translates into feelings of control, confidence, motivation, and overall mental toughness. Working hard toward a goal and making sacrifices makes players feel committed. They believe in themselves because they put the effort in. This goes a long way in developing confidence—arguably the single most salient factor in peak performance. However, being unprepared is the kiss of death in competition. When physical or mental preparation is not at optimal levels, athletes begin to doubt themselves during competition. Before the season starts sit down and evaluate your goals for the year. Make the goals SMART: Specific, measurable, achievable, realistic, and time-based. Also be flexible because one will most likely modify as time goes on. Goal setting is the first step toward greater confidence, high intensity, feelings of control, and improved motivation—cornerstones of peak performance. Also, the goals should be broken down into manageable “chunks” and based around the process—how one gets to the ultimate goal. Using a map as a metaphor, the destination could be related to a desired ranking, and the streets would be the process of reaching that destination, which are typically referred to as the performance goals – two baskets of serves, 4x per week). With SMART goals in place, players have a map for their practice sessions. If the goals are effective, they will include all key areas of development–technical, strategic, conditioning, and mental toughness. For example, mental toughness should include imagery—picturing specific scenes in one’s mind of upcoming events, which has proved to be highly effective with many competitive athletes. In fact, 95% of all Olympic athletes have employed imagery training in their practice routine. The days leading up to an event are critical for athletes to get into the proper frame of mind and feel ready both physically and mentally. Picturing success and specific skills in the visualizations are enormously effective. The brain records the messages and pictures, storing them as if the movements were actually performed in real time. Imagery can be used at any time (do not perform while driving) and is effective before, during and after practice or competition. For example, during practice, players can utilize the imagery to make technical adjustments or to improve motivation. Eventually, just a cue word can be used to remind the player of their practice goal (i.e.. Forward, turn, etc.). Cue words are effective because they simplify the learning process and keep players from over thinking. Find a quiet place to relax. Spend a minimum of 5 minutes getting relaxed (use deep breathing) with feet on the floor, arms and legs uncrossed. Do not visualize in bed because you may dose off. Begin visualizing tennis court, weather, what you are wearing, etc. The more details the better. Include all the senses. In the imagery session, visualize hitting specific shots, using your strengths, strategic plays in point situation, and see yourself confident, energized, and focused. Do this for 10-20 minutes. Try and see yourself performing at your highest level from an internal perspective (you are actually hitting the ball) or from an external perspective (like a video). Quality practice also involves high intensity similar to tournament conditions. This is difficult to experience and implement without planning. Too often, players do not play with the same intensity in practice as they do in tournaments. This slows down skill development. Therefore, players and coaches should use incentives and pressure situations and build them into the practice. Walking confidently after errors, elevating intensity for each point and visualizing pressure situations in practice will make the training more effective. For example, visualizing a crowd or a specific opponent during drills or match play, can raise intensity. Intensity is another crucial component to peak performance and can be effectively manipulated through positive thoughts, visual images, and reminders about your goals. Players should explore a variety of intensity levels to find the most effective one for their personality and performance style (ie. Agassi and Sampras). In the final analysis, preparation is about commitment. Players who establish goals, work diligently at achieving them on a daily basis, picture success, and train appropriately for competition, will find themselves performing at their highest levels. Success does not happen overnight, but is an outcome that is achieved through sacrifice, discipline, vision, and preparation.